Well, that’s certainly one way to go. Maybe when my time comes, I’ll have my body in the middle of playing the piano. Well, suffice it to say that the funeral directors at Marin Funeral Home in San Juan’s Hato Rey neighborhood have a flair for the unorthodox. For example, in 2008, they embalmed another young shooting victim and displayed his body standing up for the duration of a multi-day wake. Back to the present: Yesterday and today, callers who stopped to pay their final respects to the late Mr. Colón got a bit of a surprise. 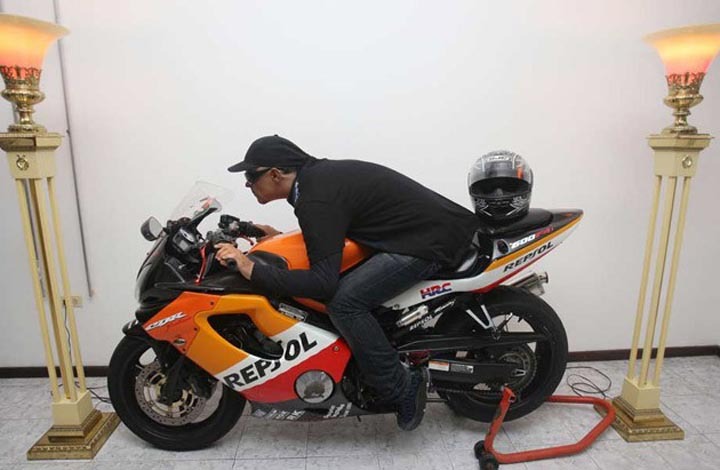 Instead of the traditional presentation of the body in a casket, Mr. Colón’s corpse, dressed in casual duds and sunglasses, was instead posed in a very lifelike position atop his Repsol-liveried Honda CBR600 F4. UPDATE: A video… if you dare.